Calcium ions are directly linked to neuronal firing at high resolution — unlike the changes in blood flow detected by functional MRI (fMRI), which provide only an indirect indication of neural activity. The new sensor can also monitor large areas, compared to fluorescent molecules, used to label calcium in the brain and image it with traditional microscopy, which is limited to small areas of the brain. 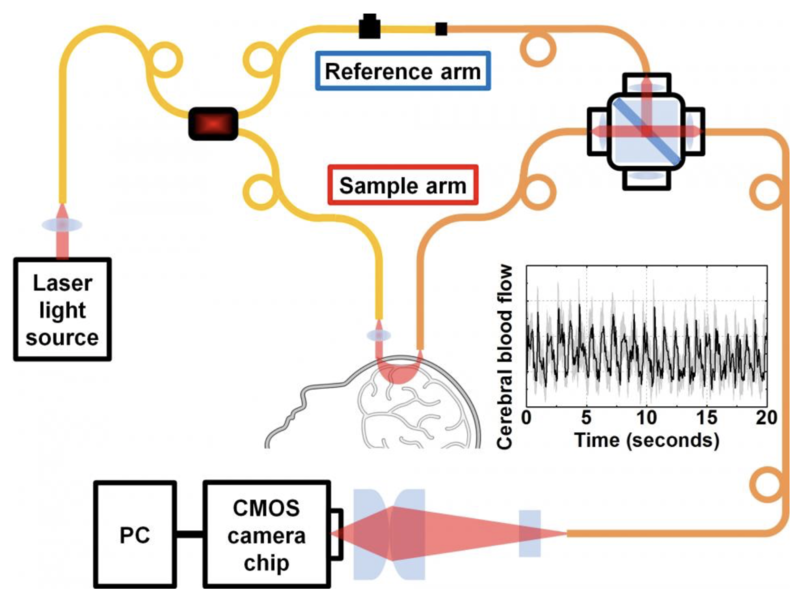 Biomedical engineers at the University of California, Davis, have developed a more-effective, lower-cost technique for measuring deep tissue blood flow in the brain at high speed. It could be especially useful for patients with stroke or traumatic brain injury. The technique, called “interferometric diffusing wave spectroscopy” (iDWS), replaces about 20 photon-counting detectors in diffusing wave spectroscopy (DWS) devices (which cost a few thousand dollars each) with a single low-cost CMOS-based digital-camera chip.